The ALPPS is a technique that allows achieving hepatic resection by a rapid future liver remnant hypertrophy. The aim of this study was to report the experience of an Italian center with ALPPS in patients with liver tumors. A retrospective analysis of patients undergoing ALPPS between 2012 and 2017 was performed. 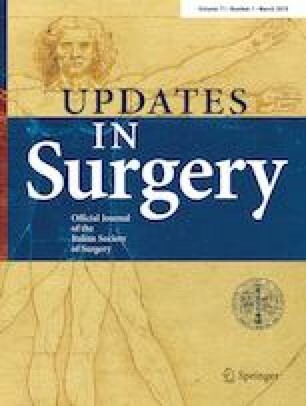 Patients’ characteristics and disease presentation, increase in future liver remnant (FLR) as well as intraoperative and postoperative short- and long-term outcomes were evaluated. A total of 24 patients underwent the ALPPS procedure: 17 procedures for hepatocarcinoma (HCC), 5 for colorectal liver metastases (CRLM), 1 for cholangiocarcinoma (CC) and 1 for Merkel Cell Carcinoma liver metastasis (MCCLM). Macrovascular invasion (MVI) was recorded in 10 (41.6%) patients: 8 (33.3%) patients with HCC had invasion of portal vein (5), middle hepatic vein (2) and inferior vena cava (1). One patient with CRLM had involvement of middle hepatic vein and one patient with CC had involvement of right portal vein and middle hepatic vein. A p-ALPPS in 14 cases (58.3%), 10 t-ALPPS (41.6%) and hanging maneuver in 19 patients (80%) were performed. Median postoperative stay was 26 days (range 16–68 days). 90-day mortality was 8.3% (two patients, one with CC and one with HCC), 90-day mortality for HCC was 5.8%. After stage 1, we counted 15 complications all of grade I; after stage 2 the number of complications was increased to 37:33 were of grade I and 4 were of grade IV. R0 resection was achieved in all patients with 100% oncology feasibility. After a median follow-up of 10 months (range 2–54), disease recurrence has been recorded in 6 patients with HCC and in 2 with CRLM. Eleven patients died, nine affected by HCC, one by CRLM, and one by CC. 2-years OS and disease-free survival (DFS) for the entire group were 47.3% and 47.5%, respectively. Concerning patients operated on for HCC, the 2-years OS and DFS were 38.5% and 60%, respectively. The ALPPS procedure is an interesting approach for large primary or secondary liver tumor with small FLR above all for large HCC associated with MVI, with acceptable OS and DFS. Authors do not have conflict of interest. The manuscript has not been submitted to other journals for simultaneous consideration. Informed consent was obtained from the study patients.